Ideas behind the future and importance of Big Data and the Cloud continue to thrive. Tim O'Reilly has been hammering home the message for some time that data will become the "Intel Inside" of the next generation of lock-in, (most recently in a fabulous keynote at OSBC). 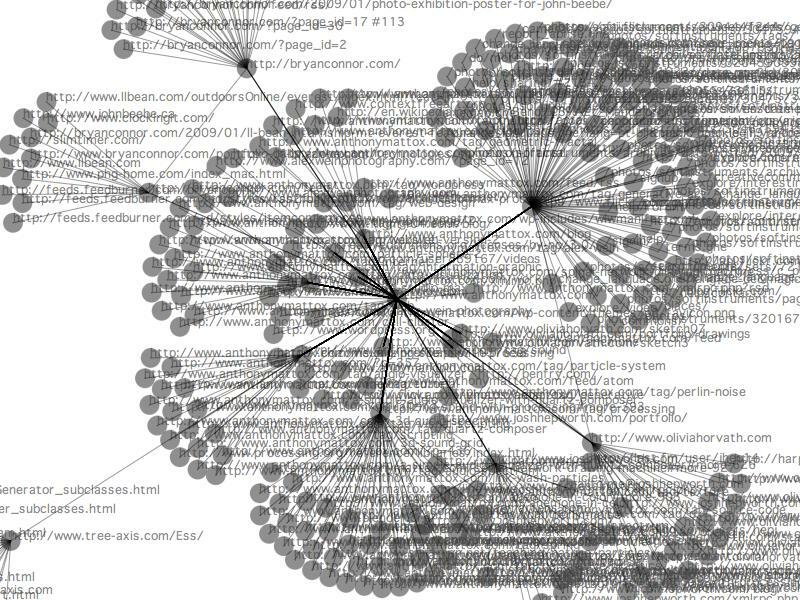 Companies like Cloudera are making big bets on the platform architecture of the next wave. And when the Economist starts to dedicate special reports to the topic, you know it's reached a particular threshold in people's minds. I've had the pleasure of knowing Carolyn Johnston for some time. She's a math geek and lead researcher in the MSN Advanced Engineering team specializing in location data and data quality. She's started blogging last week, and her topics will be both fun and educational. (I've the privilege of seeing early drafts in the pipeline.) If you care about the evolving world of big data in the cloud, I encourage you to give her a read. Critics of the teaching of evolution in the nation’s classrooms are gaining ground in some states by linking the issue to global warming, arguing that dissenting views on both scientific subjects should be taught in public schools. In South Dakota, a resolution calling for the “balanced teaching of global warming in public schools” passed the Legislature this week. After that, said Joshua Rosenau, a project director for the National Center for Science Education, he began noticing that attacks on climate change science were being packaged with criticism of evolution in curriculum initiatives. He fears that even a few state-level victories could have an effect on what gets taught across the nation. James D. Marston, director of the Texas regional office of the Environmental Defense Fund, said he worried that, given Texas’ size and centralized approval process, its decision on textbooks could have an outsize influence on how publishers prepare science content for the national market. It's a disturbing article to read in general. It's terrifying because it presents the idea of small steps, none of which are catastrophic (e.g. South Dakota), leading to a destination where the world has changed in the most fundamental of ways (i.e. Texas setting the tone for the national market). In a kind of Wikipedia of textbooks, Macmillan ... is introducing software called DynamicBooks, which will allow college instructors to edit digital editions of textbooks and customize them for their individual classes. I have great confidence that the contracts the authors sign will give MacMillan the ability for appropriate copyright control to allow this sort of re-editing. But let's be really really clear. This is NOTHING like Wikipedia. The ability to change the author's original content to suit one's own needs is not the same as providing a rich editing environment where controversies are clearly apparent. The ability for a professor at a university with a strong religious bent in a State "simply championing academic freedom in general" to edit text books to suit their needs is a recipe for disaster. Credible sources (and the original author's brand and credibility) can be twisted to support the insanity of challenging established science. This is not good. Writing the rules such that content can be changed without changing an author's intentions is still a recipe for disaster as it will place efforts to police, debate, and correct things on the authors and the system. The damage will have been done. Orwell suggested that language precedes thought. If there is no word for a concept, it cannot be expressed. A proper tyranny would do well to remove such words from use. In the modern web connected world, the concept may still exist on the web, but sowing confusion may replace the need to remove a word from use, or to destroy a book outright. Textbooks still have weight in our society. It's not just the literal weight of paper, but the sense of organization and flow and prestige and credibility. They are also a legacy of a particular way of teaching subjects. As more professors explore the ability to develop course materials from an array of online sources into a coherent collection that matches their curriculum, the textbook will rightly shift in the minds of students and lecturers alike into something that is less important. In such a case, one might presume that individual course collections maintain copyright appropriately, with individual authors credited for their contributions, as well as the overall collected work copyright. This is a interesting marketplace design problem where individuals, journals and historical textbook companies make materials available for use to lecturers assembling course readings. More importantly, however, it means the integrity of the original materials will be maintained. 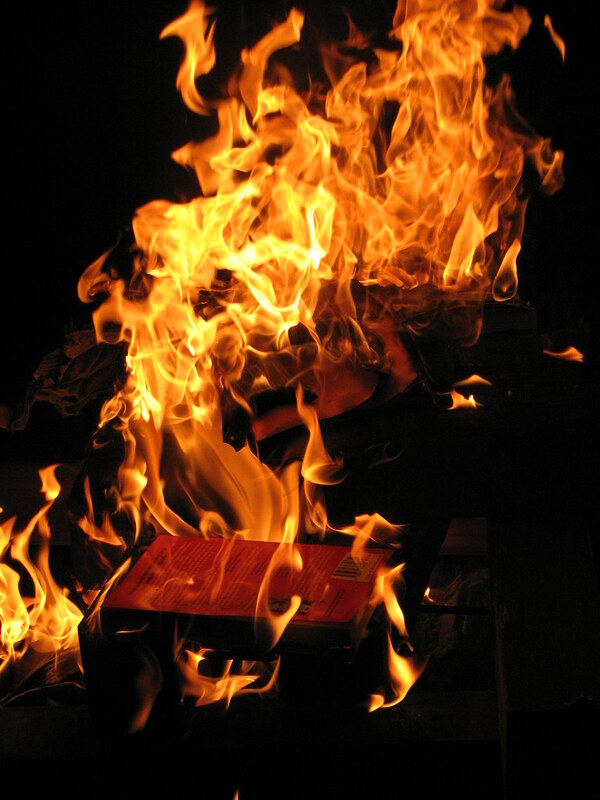 No "books" need be destroyed in the process. Tim O'Reilly tweeted a great article from the New York Times on the math of publishing traditional print versus eBooks. If you publish print books, and aren't as aggressive as O'Reilly Media at experimenting with new forms, or looking over your shoulder at Scribd, then you would feel very justified about the entire NYT article. But it ignores the future in a very fundamental way. It assumes the weight of the entire book publishing process from author and editor through paper manufacturing, distribution, and end-retailer needs to be maintained. I would mourn the loss of book stores as much as the next bibliophile. There are a thousand or so books within easy reach in the apartment. There are amazing bookstores throughout the world in which I find peace and solace from the chaos amongst all that collected human creativity, knowledge, and imagination. Good book stores smell right, and you know a good book store the second you walk into them. Book stores are indeed holy places. 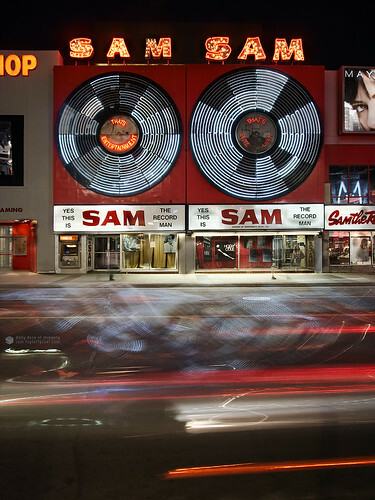 But I remember growing up with Sam the Record Man in Toronto. Three floors of goodness, with the finest collection of jazz, classical, and rock music in Canada. Sam's spawned an entire chain across the country. A&A Records was next door to the flagship Sam's. There were many pilgrimages to the pair of stores through my teen years and early twenties. And like a good book store, Sam's just smelt right. I will always have the memory and my daughters will never know what they're missing, except they don't want to either. They have their own generational memory. The way we consume music has changed. Records were supplanted by cassettes, then CDs. Now many of us live in an iTunes and Amazon MP3 download enabled world. The traditional distribution chain changed. New musicians often self promote for a period of time, producing their own CDs and selling their music through iTunes, before being "discovered" by a label to help them scale. The music now promotes the concert tour revenue stream, rather than the other way around. This will happen to the book publishing industry. The model will change. People outside the publishing house will re-invent the book and how it's consumed. When does someone set up an Internet marketplace for authors, editors, copyeditors, and illustrators to find one another and share the revenues directly? Google has a tool base for online collaboration and are certainly interested in books. With Amazon's latest royalty offering for Kindle, an author can deliver a Kindle edition and could "share" their 70% royalty with editors that made the book better or illustrators that did the cover design. Or maybe the payment system front loads the payments to the supporting "staff" before the author begins to make the lion's share. Indie movies and indie music have been around for a while, when do we end up with a serious indie book industry? If we have an indie eBook publishing industry, does producing limited copies for browseable book stores and gifts become a new publishing industry? Do such copies in bookstores become collectibles because they're more scarce? What publishers (in what countries) will become the de facto efficient producers of one-off or limited run books? Public libraries are interesting from an economics perspective. They exist to support and encourage literacy. Their funding model is local government set. The books they buy are often a more robust expensive package (as are their books-on-tape, and their CD prices are often higher to reflect replacement costs). They often provide Internet access but even here on Microsoft's doorstep in Redmond, Washington, the 25 or so PCs are always in full use. I don't think libraries are going to be replaced by eBooks any time soon, but some publishers are already trying to reconfigure to chase strictly the high margin school/library market. When is the vanity of coffee table books and browsing the book case when you visit someone's house get replaced by a digital wi-fi connected picture frame rolling the covers of the family's collected eBooks collections? Or when indeed do beautiful photo coffee table books become the download for the picture frame on your living room wall (with the helpful text a bluetooth read on your tablet away). Or does having books themselves become the cultural vanity item? All of these are of course random ideas of an unknowable future. But as Clay Shirky observed this week: "Abundance breaks more things than scarcity does. Society knows how to react to scarcity." P.S. Sam's is literally gone now. You can still see a little of the Sam's logo painted on the wall of the back alley. A&A's was taken over by HMV for music and videos. And the Future Shop (like Best Buy for U.S. readers) ironically was there as well. HMV and the FS are expanded and down the street now on better real estate.